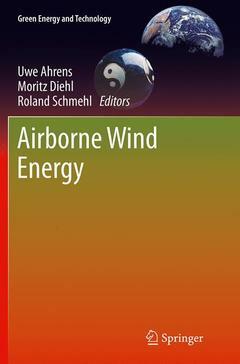 This reference offers an overview of the field of airborne wind energy. As the first book of its kind, it provides a consistent compilation of the fundamental theories, a compendium of current research and development activities as well as economic and regulatory aspects. In five parts, the book demonstrates the relevance of Airborne Wind Energy and the role that this emerging field of technology can play for the transition towards a renewable energy economy. Part I on "Fundamentals" contains seven general chapters explaining the principles of airborne wind energy and its different variants, of meteorology, the history of kites, and financing strategies. Part II on "System Modeling, Optimization and Control" contains eight contributions that develop and use detailed dynamic models for simulation, optimization, and control of airborne wind energy systems, while Part III on "Analysis of Flexible Kite Dynamics" collects four chapters that focus on the particularly challenging simulation problems related to flexible kites. Part IV "Implemented Concepts" contains eleven contributions each of which presents developed prototypes together with real-world experimental results obtained with the different concepts. Finally, in Part V on "Component Design", five papers are collected that address in detail the technical challenges for some of the components of airborne wind energy. Airborne Wind Energy presents all basics in a single source to someone starting to explore wind power in the upper atmosphere and serves as a valuable reference for researchers, scientists, professionals and students active in the innovative field of Airborne Wind Energy. Part I Fundamentals: Airborne Wind Energy: Basic Concepts and Physical Foundations.- Traction power generation with tethered wings.- Pumping Cycle Kite Power.- Efficiency of traction power conversion based on crosswind motion.- An Introduction to Meteorology for Airborne Wind.- Kites: Pioneers of Atmospheric.- Financing Strategies for Airborne Wind Energy.-Part II System modeling, Optimization and Control: Theory and Experimental Validation of a Simple Comprehensible.- On Modeling, Filtering and Automatic Control of Flexible Tethered.- Wings for Airborne Wind.- Modeling of Airborne Wind Energy Systems in Natural Coordinates.- Numerical Trajectory Optimization for Airborne Wind Energy.- Model Predictive Control of Rigid-Airfoil Airborne Wind Energy Systems.- Airborne Wind Energy Conversion Systems with Ultra High Speed.- Model-Based Efficiency Analysis of Wind Power Conversion by a Pumping Kite Power.- Economics of Pumping Kite.- Part III Analysis of Flexible Kite Dynamics: Aeroelastic Simulation of Flexible Membrane Wings based on Multibody System.- Nonlinear Aeroelasticity, Flight Dynamics and Control of a Flexible Membrane Traction Kite.- Simulation BasedWing Design for Kite Power.- Estimation of the lift-to-drag ratio using the lifting line method: application to a Leading Edge Inflatable.- Part IV Implemented Concepts: Application of an Automated Kite System for Ship Propulsion and Power Generation.- Design and Testing of a 60 kW Yo-Yo Airborne Wind Energy Generator.- Modeling and Testing of a Kite-Powered Water Pump.- Design and Experimental Characterization of a Pumping Kite Power System.- Development of a Three-Line Ground-Actuated Airborne Wind Energy.- Combining kites and rail technology into a traction based Airborne Wind Energy plant.- Description and Preliminary Test Results of a 6 Degrees of Freedom RigidWing Pumping System.- An experimental test setup for advanced estimation and control of an airborne wind energy system Analysis and Flight Test Validation of High Performance Airborne Wind Turbines.- High AltitudeWind Energy from a hybrid lighter than air platform in a pumping cycle with aerodynamic lift from the Magnus.- Lighter-Than-Air Wind Energy Systems.- Part V Component Design.- Ram-airWing Design Considerations for Airborne Wind Energy.- Conceptual Design of Textile Kites Considering Overall System Performance.- Airborne Wind Energy Tethers with High-Modulus Polyethylene Fibers.- Non-reversing Generators in a Novel Design for Pumping Mode Airborne Wind Energy Farm.- Software System Architecture for Control of Tethered Kites.